They evoke poetry, these stoic trees with their impermanent permanence. Changing hues with changing weather; the trunks now copper, now ashen, the leaves turning green, then gold … then gone with the whispering winds. Time is both their master and their slave; it can strip them naked or adorn them with jewels, but is unable to budge their ancient roots an inch without the consent of the elements. The blueness of the heavens is sometimes more yellow than grey. The greenness of the earth, patched with sunny clearings amidst long shadows, changes from warm to cool with changes in the sky. 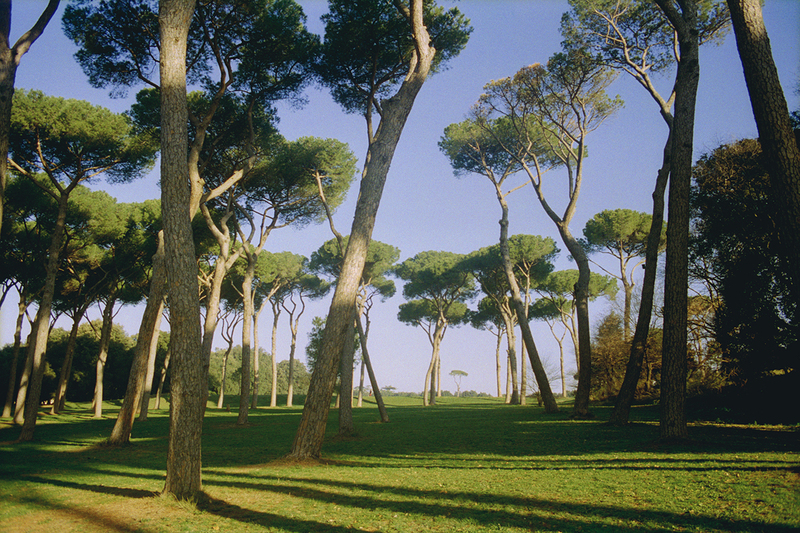 But the trees stand as they have stood for hundreds of years in the gardens of the Villa Doria Pamphili, silently offering refuge to anyone who seeks shelter under their boughs. Vivien Bittencourt, “Winter (Doria Pamphili series),” 2001-02. Fujicolor Crystal Archive print, Edition 1/9, 26 1/2 x 36 1/2″. Courtesy of the artist. The Villa itself has been through much over the years, from its 17th-century construction to the architectural extensions over the years. A battle or two were fought in its lap before it became what it is today; the largest landscaped public park in Italy, comparable in scale and circulation of people to New York City’s own Central Park. Yet Bittencourt’s images capture a kind of romance that seems somewhat ethereal, as if the trees exist in their own time, in their own world, outside of human encroachment or influence. The artist depicts a sense of isolation without making it seem like a moment of loneliness, almost as if she feels herself to be one with the trees—almost as if she ages with them instead of with humankind. Each image portrays a private moment of recognition between her and the landscape, undisturbed by the presence of the outside world. Where fancies grow, and where the Muses sing. Whereof a posy up in verse I make. There gather flowers that are newly blown. Cavendish’s words become a kind of testimony to the evident bond between Bittencourt’s images and Katz’s words, but while looking at the lush trees in the photographs, more suggestive is the way in which the poet compares her husband’s fertile imagination to the generosity of nature and its ability to inspire each person in a unique way. Just as her husband’s thoughts become the poet’s garden and his words the flowers she uses to create her own inimitable bouquet, so do Bittencourt’s gorgeous photographs—so powerful in their ability to move Katz to create his own tender images—offer fertile ground for anyone who, as Davies once wrote, takes the time to “stand and stare” at nature’s infinite variety, and in doing so discovers one’s own poetic turn.